Just got this 432MB patch. Stayed at October security patch. Still Android 8.0. Notice build number jumped quite a bit. Droid3r and BerryBubbles like this. That's a good size patch!! 1st impressions: my intelligent scan is working faster than ever even in the darkest room with no light, freaking awesome. Second, phone is snappier, no lag whatsoever. Third, I think this is just the update to allow us to join the beta for Pie. Got it on sprint too. Thanks for posting. Didn't know it was even there! 😁 This update does indeed feel snappier and the face unlock is quick! My battery is at 50% at the end of the day. Usually it's around 25% at this time. Seems better overall! Nothing for US unlocked version. 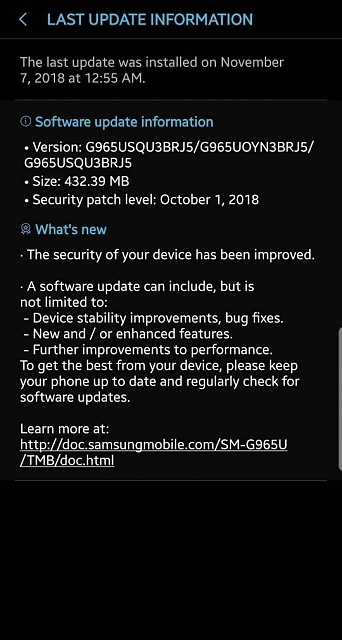 Just the 1st October security update. I noticed after update when I power the screen it's brighter and that's annoying at night. You guys too? Once I log in it dims back to normal. I have not noticed any variance in my screen brightness. I did clear my cache partition twice, with the hope that the update would settle in smoothly. I have found that after 8 months with really lousy call quality, this update seems to have cleared up the issues. -Calls that sound like the caller has a bucket on their head. All of a sudden, my phone sounds & acts like a phone. I'm holding my breath, 'knocking on wood'. I hope it doesn't revert back to the 'two tin cans & a string' sound! Anyone else seeing these annoying popups when opening any old text messages ? 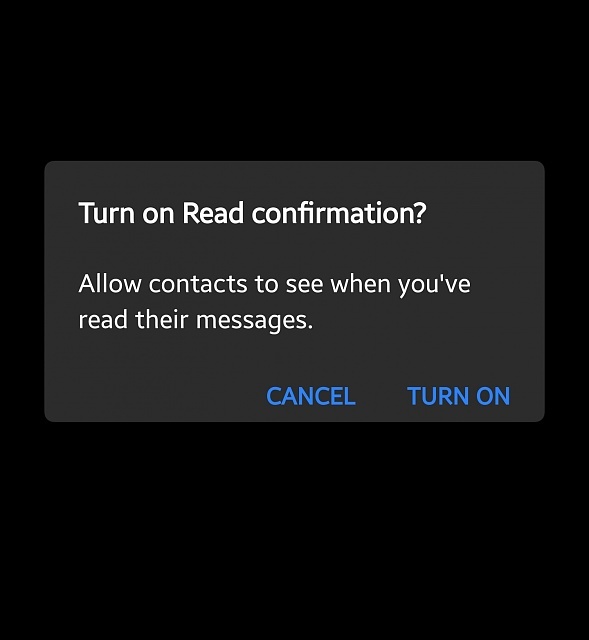 I have the read receipts off in the settings but the messages app keeps asking me this on every message from different senders to turn on the read receipts. Its ok if it was a one time thing but its annoying to see on every single message thread. Anyone else facing this issue ? T-Mobile S9+ latest update as shown in the first post. I updated my phone last night. Yes. It pop up everytime. I had to just say yes. I have the same issue. Anyone know how to fix? Found it. Just wipe cache partition. What is the Upsell app and why did i need to update it? How's the November Update So Far? Is s note compatible with samsung tab s4?